I'm one of those annoying people that pretty much eats what I like and I still stay slim(ish). I have a good metabolism, good genes and after reading this book, I also assume that I have a good diverse range of microbes in my gut. I'm lucky that the food I like is mostly the healthy stuff - you know fruit and vegetables. Although my main weakness will always be cheese and chocolate and the occasional pack of chicken chips. 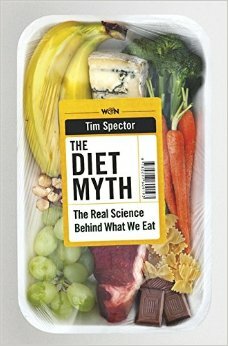 The Diet Myth discusses all the facts, fictions and fads that now influence our modern eating lives. After a personal health scare, Tim Spector, Professor of Genetic Epidemiology at Kings College, London decided to change his eating habits and research the best way to do this. He thought that this would be his "greatest challenge - but it turned out that finding out the truth about food was an even greater one." Diets, food and our health are surrounded by bad science, myths and dogma. Spector was keen to explore the layers of "biological complexity". Microbes & the importance of diversity - in microbes in your gut as well as food types. This is an easy to read, easy to understand book. The science is fascinating and reinforces many of the ideas I've been coming across for the past few years. Spector finishes with a few essential facts to help us in our food choices. "Our bodies vary entirely in how they respond to everything, from food to exercise to environment, and this variation affects how much fat we deposit and how much weight we gain as well as our food preferences....the variation is due in part to our genes, but also to the different microbes that populate our guts." But "there are certain facts about diet that are unarguable: diets that are high in sugar and processed foods are bad for our microbes, and by extension our health, and diets that are high in vegetables and fruits are good for both." Learn to listen to your stomach - discover what works best for you. Try new foods - we need to eat more diverse foods not less. "Avoid bursts of unsustainable dieting on restrictive food plans that inevitable rebound....weight loss through intermittent fasting looks as if it may be more likely to alter your microbial community for the better." Eat traditional cheese and yoghurt, avoiding the high-sugar varieties. Eat fruit and vegetables in season to increase the diversity of our food. Experiment, but avoid destroying your microbes with "preservatives, antiseptic mouthwashes, antibiotics, junk food and sugar". My own personal mantra is 'don't believe the advertising'. So many of the studies are commissioned by the large food corporations. So many of the assumptions that we currently have about food comes straight from the marketing arms of food companies. They want us to buy their sweet breakfast cereals, their sugary drinks and their packaged goodies...and they want us to buy as many of them as possible. Reading this book has confirmed what I have discovered for myself during the last 18 mnths of doing the Fast Diet with Mr Seasons. Intermittent fasting works - it feels good, is quite easy to do and it encourages me to eat in a healthier way during the other days. But I don't panic if I eat too much at a dinner party or skip a week. Giving up processed breakfast cereals was one of the best things I ever did. I now make my own toasted muesli and make my own spiced yoghurt to put on top. It took several months, but I also weaned myself off sugar in my coffee. Portion control is my aim at every meal. Everything in moderation, balance and diversity are my key words when eating or exercising. I highly recommend this book if you are looking for dieting inspiration and the reasons why something is good for you or not. You know anything about food, advertising and the hidden fats and sugars interests me. Did he mention processed meats. Those hamburgers, bacon, ham, sausages, hot dogs that are just fat, scrap meat, salt and chemicals? Unfortunately these processed meats are cheap and sustain many a person. Good call about the advertising, Read Sugar, Fat, Salt my M. Moss.... Madison Avenue ( advertisers) lie through their broad and assuring smiles! I thought this would interest you Nancy. He didn't single out processed meats, but simply emphasized how bad it was for your gut to eat too much processed anything. People like Michael Pollan & M Moss cover the specifics. I just discovered your post with the ' food ' books + reviews. I'll have time to look at them this weekend with our 'extra' hour ( clocks tuned back tonight)!